The first lady’s programs have been well received by most and have had support from public and private sector organizations in not only helping promote healthier choices, but also lowering the costs of fruits and vegetables as well to make them more affordable. In a time when children have been less active due to television, video games, and are less likely to get outside activity, these programs have proven invaluable. The fact that children are kept inside instead of being shoved outside to play is a very large factor in the obesity problem we have with today’s children. One cannot expect kids to sit around and magically stay in-shape. It’s real easy to blame happy meals and its toys for the problem as San Francisco did several years ago, instead of looking at the real culprit in the mirror; the parents. The program has helped some children whose parents don’t provide nutritious meals at home have the opportunity to get one of those meals at home each day. It has also helped to educate others on the importance of limiting a fast food diet and encouraging their children to be active. The fears of a new incoming administration cutting back on these programs is an important item to take heed of. While there has been no official stance on these programs from the President-Elect, Republican lawmakers will be looking at every issue across the board that they can scale back from an Obama administration who they felt was overreaching in a lot of their regulations and requirements when it comes to food safety. With full control of the house and a majority in the Senate, there is no reason not to assume that Republicans would be able to make changes without much opposition; and not much backlash at a state level where they have gained a great majority across the country. 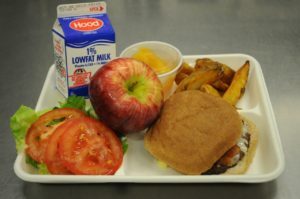 “I would be very surprised if we don’t see some major changes on the school lunch program” and some other food issues, said Rep. Robert Aderholt of Alabama, the Republican chairman of the House subcommittee that oversees Agriculture Department spending. Aderholt, who sits on Trump’s agriculture advisory committee, says the Obama administration’s approach was “activist driven” and people who voted for Trump are looking for a more common-sense approach. It’s again important to reiterate that nothing has been mentioned from Trump himself in regard to this matter. However, that’s not to say that this is not on his team’s agenda or that he would not sign off on any changes that come from the Republican led congress. Everything at this point though, is pure speculation based on Trump’s personal like for fast food in general and comments from lawmakers in the past several years. No matter what happens in the coming term, it is important to note that even if some of the programs cease to exist, there is a responsibility of every American to take care of their children and to ensure that childhood obesity is curbed. Even if school lunches were to go back to where they were, parents can still pack a healthy snack or lunch to send with their kids each day. Most children should be okay in this regard, but this will always leave out those who rely on a free school lunch. In those situations it’s equally as important to keep promoting physical activity to help curve the effects of higher calorie foods.